CCNA Security certification is widely viewed as a great starting point for learning networking security fundamentals. Earning CCNA requires passing both the Cisco CCENT/ICND1 100-105 and the Cisco CCNA Security 210-260 IINS. In most circumstances, candidates who are looking to certify their CCNA will have one to three years of experience working with Cisco products. This makes the CCNA a great certification for people with experience who wish to validate their skills, as well as an ideal starting point for those starting out in IT. On top of all of these benefits, the CCNA Security meets the requirement for DoDD 8750/8140 baseline certifications IAT Level I and II. There is also CCNA Security syllabus material and a CCNA Security study group, so you can connect with other CCNA Security students. Trainer Keith Barker has put together a comprehensive 30-hour, 70-video CCNA Security course. Keith’s training maps directly to CCNA Security 210-260 IINS exam objectives. You’ll not only be learning new skills, but you’ll also be better prepared for exam day. A CBT Nuggets subscription includes access to in-video quiz questions, supplemental files, and Kaplan® IT Training practice exams. These additional resources supplement your video training — and help you reinforce and retain information. Everybody’s study routines are different. What works for some people might not work for others. We have a general CCNA Security study plan that we provide learners looking to conquer their exam in about 10 weeks. But you might need additional resources or just more time. This is a baseline plan you can tweak to fit your own needs. You’ll want lots of hands-on practice for the CCNA Security. Your plan needs to incorporate Kaplan® IT Training practice exams. Going into an exam blind is a scary process. You can’t adequately prepare for something if you don’t know what you are dealing with. Space out practice exams through your training. We recommend three: At the beginning, middle, and end of your studies. Gaining familiarity with the types of questions you’re likely to see will make exam day that much less of a scare. The CCNA Security is an entry-level exam, but you should already have experience. Start off by seeing how much you know by taking a the Kaplan® IT Training practice exams. It might seem a bit soon. However, it can help guide your next 10 weeks. Your exam results will provide a baseline in terms of the topics you already have a handle on versus those that might need a little extra time. The first five nuggets of the CCNA Security course cover basic security implementation principles. The Port Security Concepts and Port Security Implementation training will help you know which ports to lock down. You’ll also look at DHCP Snooping Concepts to round things out for the week. At this point, think about ways to supplement your video training. Many CBT Nuggets learners also use textbooks or study guides too. Weekly Time Commitment: About 150 minutes. There are 47 minutes of videos, a practice exam (90 minutes), and time to research supplemental materials. Nuggets 6-10 continue diving into DHCP Snooping, especially how to implement it. Next, you’ll delve into more networking concepts including PVLAN and DAI. You should have downloaded the supplemental files for the course by now. If not, we’ll point you in the right direction.You should also review the Cisco Security 210-260 IINS exam topics. Knowing the exam requirements will keep you thinking in Cisco’s hierarchy while you study. Weekly Time Commitment: About 2 hours. You will watch about 70 minutes of videos this week, plus you’ll want to download supplemental files and peek at Cisco’s exam requirements. This week changes gears a little — with Nuggets 11-15 taking on CCNA-based topics such as secure switching and firewall services. You’ll also explore GNS3 Integration, and how Zone-Based Firewalls work. Weekly Time Commitment: 90 minutes. This includes 54 minutes of video training and time to review the material. We are just about at the halfway mark, and the finish line is coming into view for you. If you haven’t already, it’s time to book the exam. The reality of the situation sinks in a little more quickly when you have a date on your calendar. It also helps reinvigorate your will to study if you find your enthusiasm is starting to run low. This week, watch Nuggets 16-20, which cover ASA Concepts, Integration and Activation. You’ll also learn how to build an ASA GNS3 Topology and configure it via the CLI. Have your notebook ready for this one, and fire up your own CLI. If you are looking for a little fun, check out some of Cisco’s games on their website. They’re a nice change of pace, while still reinforcing what you’ve been learning lately. Weekly Time Commitment: 53 minutes of Nuggets. But you’ll want to be really really good with the command line, so don’t put a time limit on that time. Nuggets 21-25 really hone in on Cisco ASA. This week we also start really getting into the meat of lab practice. Don’t forget to rev up your virtual environment and practice as much as you can with labs this week. Get familiar with all of the exercises that are outlined in the videos and study guides — and get comfortable with the CLI. It’s also time for you to take another Kaplan® IT Training practice exam. Use this practice exam round to identify what you’ve concepts and terms you’ve got down so far. Take note of the areas you struggled with, and mark them for further review. Weekly Time Commitment: About 2.5 hours. You’ll watch 51 minutes of videos and take a 90-minute practice exam. Week 6 involves getting more hands-on practice with ASA, MPF, and DMZ Labs, as well as NFP, Hardening, and AAA. You’ll cover all this in Nuggets 26-30. This week’s material lends itself well to again using virtual labs. Applying what you’re learning to real-life scenarios gives you a deeper, real understanding of the content. Finally, remember the notes you took from your practice exam results? Get them out. You should start reviewing the content areas you struggled with on the test. You don’t want to wait until the week of the real exam to dive into “problem” areas. Weekly Time Commitment: 75 minutes. This includes 42 minutes of videos and time to review content areas that need more reinforcement. This week, you’ll explore the world of cryptography and VPNs. Videos 31-35 hone in on IDS and IPS as well. This is another week, we strongly encourage you to lab it up. Or take yet another practice exam. You’ve covered a lot of material so far. If you get stuck on a concept, take a break from it and return to it later. Remember, there are plenty of resources available in the Cisco CCNA Security Study Group. Be sure to keep checking in for updates and information when you need a little help. Weekly Time Commitment: 75 minutes. You’re going to be watching 46 minutes of videos, plus you want some time to poke around the Cisco CCNA Security Study Group. It’s hard to believe, but you’ve arrived at the final week of videos — and you only have three (Nuggets 36-38) to watch. But you’re not out of the woods yet. This opens your schedule up to really start cramming. Anything that still isn’t making sense can be pulled apart and learned again until it makes sense. Kaplan® IT Training practice exams and labs are very important at this stage. Review, practice, watch, repeat. Weekly Time Commitment: 2.5 hours (at least). This accounts for 35 minutes of videos, a practice exam (90 minutes), and review time (dependent on how much you need). There aren’t any required videos this week. Rather, you should be addressing all your weak areas. Take the time to rewatch videos, lap it up, or do additional reading. Turn those weak areas into strengths. Use every resource you can to ensure you have a good grip on the material. Weekly Time Commitment: 2 hours (at least) of review. You are ready for the big day. Congratulations, it has been a lot of hard work. Hopefully, you’re feeling pretty confident. At this point, you should be scoring about 90 percent on practice exams. If there are still areas you’re struggling with, you’ve got a week to hone on them. Before the exam, it’s not a bad idea to take one last look at the certification exam policies from Cisco. Make sure you’re fully prepared for what’s coming exam day. Weekly Time Commitment: 2 hours (at least) of review. And then it’s exam time. Make sure you get a good night’s sleep the day before. 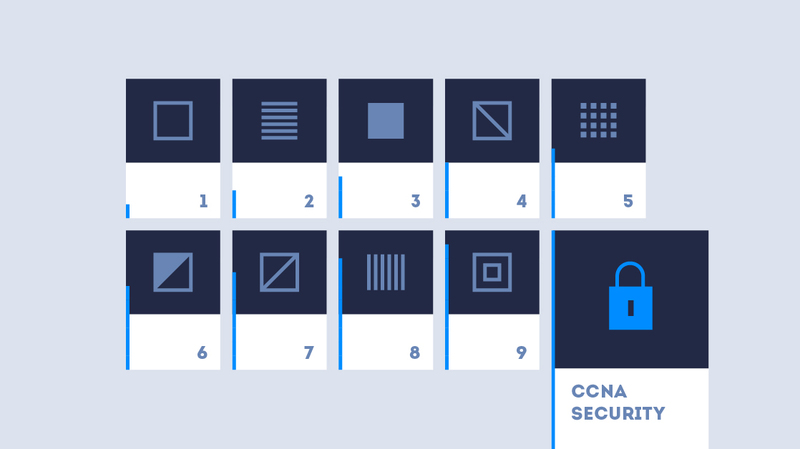 Security is a big journey to embark on — and the CCNA could be your first step. Earning your CCNA enables you to pursue higher Cisco certification — acting as the catalyst in your certification journey toward CCNP or CCIE Security. Getting that CCNA will set you on a path toward becoming a cybersecurity expert.